I have to say, after hearing/reading all the recent stories about photographers being arrested or detained for shooting train stations, buildings, etc… in public locations, I was trying to be mentally prepared for a little trouble. In fact I almost just skipped it. However, I had already shot the Wilder building a few days before and I really liked the look of the Powers building and wanted to find a way to capture it too. 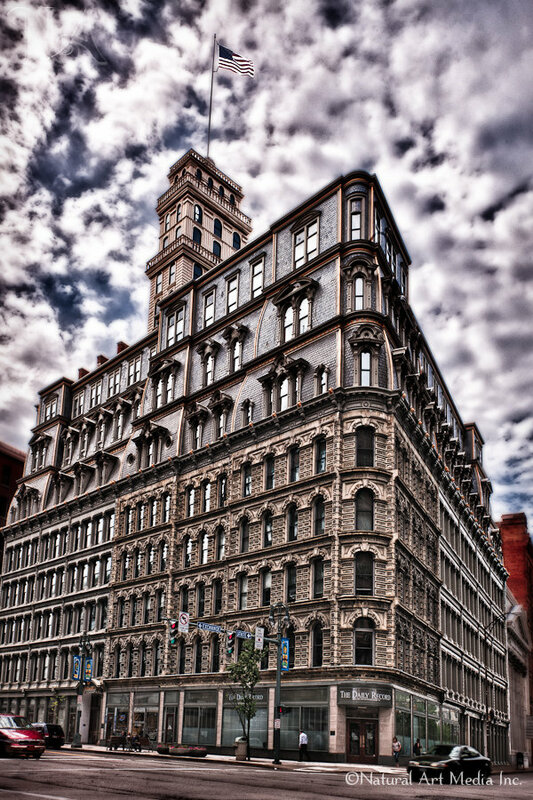 The Powers building is on the corner of State and Main, diagonally across the street from the Wilder building. There was a lot of heavy traffic at this intersection and there was even a traffic officer here directing traffic even though there were stop lights. Considering the situation, location, the fact that I had a lot of equipment with me, back pack, wheeled camera case, the tripod, camera, promote control and all the “wiring” that goes with it; and I was on the very edge of the sidewalk with one tripod leg in the street gutter I thought for sure someone was going to detain me or at least tell me I could not photograph here. However, just as I was starting to setup the on-duty traffic officer’s shift ended and although he watched me intently for a few minutes, he got in his patrol car and left without saying anything. The arriving traffic officer parked right next to where I was setting up, hopped out of his car and started chatting. He wanted to know what kind of camera I was using, what I thought about it, what kind of photography I did, where I was from, if I did this for a living or just for fun, etc… He was very friendly and it didn’t feel like I was being questioned at all – he seem genuinely interested in what I was doing. After finding out I was from Washington state and had never been to New York before he offered suggestions of other interesting locations around Rochester I should go photograph. He also told me the brief history of the Powers and Wilder buildings and directed me to a plaque on another street corner that explained the buildings. He also told me where to go and how to get into the Powers building and suggested that I should go in a photograph it because it was really ‘cool’. So, it turned out that I had a very positive experience and even got some good pointers on other places to go. If you come back you’ll probably see some of those posted later. I just realized as I was typing, nearly everyone I met in Rochester was very nice and helpful. I was on the streets a lot with a lot of gear, and even went some places I wasn’t supposed to – those photos are coming up soon – and every person I interacted with was very pleasant. Maybe that shouldn’t have surprised me, but never having been to New York state, I guess I had different expectations. It was very overcast, but bright outside and it just mostly looked grey. I shot this on the dark side to recover some of the detail in the sky during post processing. The 7 exposures were combined using HDR Express from Unified Color and then after some heavy perspective adjustments in Photoshop I used some OnOne PhotoTools to bring out the detail and contrast in the building and soften the clouds. As often happens, I’ve been working on a file that is over 1Gb in size and more then 6000 pixels on the longest side. The 900 pixel image for the blog post just doesn’t seem to do it justice. I really like the sky in this one and the perspective gives a 3-D effect to the building.